This is the brief speech I will give in the first lecture of my Introduction to Agricultural Economics course, in an attempt to convince students that economics is important. Our time is the very best time to be alive. No one in our generation should want to trade places with someone from the past. Moreover, this new world we have created—I stress created, because this was not manna from heaven—has only been around 50-200 years, although man has existed for maybe 200,000 years. We have better food, more freedom, live longer, and experience less violence than our ancestors. How did we achieve this world of freedom and plenty? You probably answer: technological innovation— accumulation of knowledge and how to put it to use—and you are partly right, but in the past we were more eager to use technology for the purposes of war than for the enhancement of people's lives. Something of greater importance has changed: our culture. To be specific, we have become a culture of commerce. Eager to sell and trade with other people using money, we believe that engaging in private business for personal profit is a dignified pursuit, so long as you do it honestly and fairly. Moreover, we are respected when we learn how to create new, better products, and the word entrepreneur is perceived positively when heard. Even China, an ostensibly communist country, has realized it will only acquire the wealth of America and Western Europe by allowing—even promoting—commerce. This is a relatively new culture. Throughout history, business was seen as an undignified activity, even immoral. Ancient China ranked merchants as the lowest social class, even below peasants. As the Industrial Revolution began and business owners began acquiring significant wealth, for the first time there was a class of people more powerful than the nobility. This bothered many of the nobility, because they believed one could only gain wealth by taking wealth from others—life was seen as a zero-sum game. If you look at historical cultures—Medieval monarchs, Ottoman Empire, Roman Empire, Sparta, Babylon—the only way they knew how to acquire wealth was to use their armies to conquer others and confiscate their land and wealth. The rise of business then meant their wealth was being stolen, from the noble's point-of-view. That was not the case though, because commerce is a positive-sum game where everyone can acquire greater wealth. We know that commerce is a positive-sum game because [voluntary] trade is a positive-sum experience. You benefit immensely from belonging to a society that trades among itself. Think of all the things you consume in a day: housing, food, ipods, television, movies, cars, beer, beer, beer, ... Now, think of how long it would take you to produce these items all by yourself, if you lived in isolation where everything you consumed you had to produce yourself. That is a world without trade. Even if you possessed all the books in the world, giving you the knowledge to produce all these things, you could not possibly produce even 10% of it in your lifetime. Virtually everything you consume is available to you because of trade with others. Don't believe me? Try living like Robinson Crusoe for a while. You'll eventually agree. Making an honest profit is a good thing. One can only make more money (legally) by selling a higher quality and/or lower priced product than your competitors. Because of this, every year we get the same products at a lower price, because businesses like Wal-Mart replaces less efficient stores. See the video below to observe the proliferation of Wal-Mart across the U.S, and note these stores multiplied because consumers wanted Wal-Mart to come to their town. Likewise, every year the goods we consume are of higher quality. 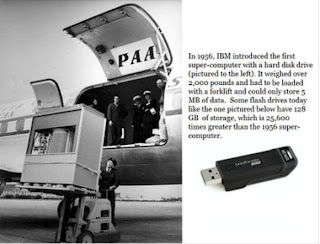 Consider this picture, showing two hard drives of equal storage capacity. A huge one from 1956 and a tiny one from today. 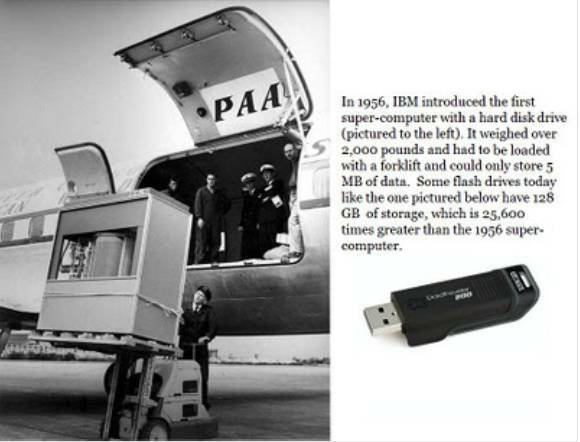 Computers become faster and have greater memory every year because product improvement is the only way a computer company can stay in business. Let's not forget that commerce also leads to the creation of new products, like smart-phones. Don't let anyone tell you we should not allow progress from commerce because some businesses go broke in the process. The people who used to make horse carriages went broke. The firms that made typewriters went broke. We don't want to travel by horse and cart, nor do we want to write papers on typewriters. These firms went out-of-business for a good reason, and they eventually found something else to do. To create our new world some things had to be destroyed, and this is a price we are eager to pay. Not every country has adopted the institution of commerce. North Korea believes a feminine-looking man can direct the millions of North Korean citizens better than the laws of commerce. 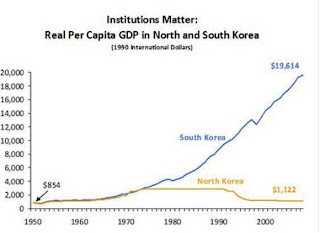 Observe the consequence of North Korea's government in the left graph. This picture shows the night-time sky of three countries. 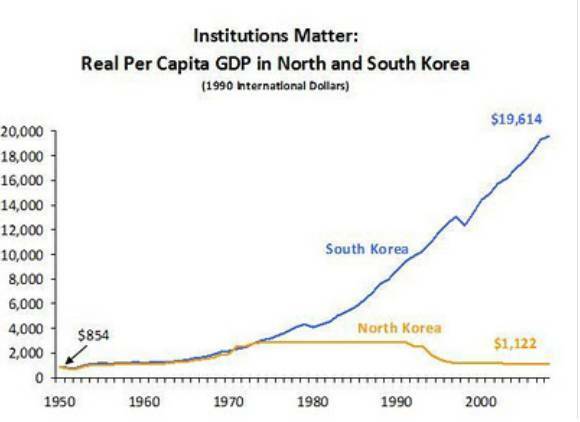 At the bottom is South Korea, who adopted an American-style system of democracy and commerce. In the middle is North Korea, and at the very top is Russia who has lately become more open than North Korea to commerce. 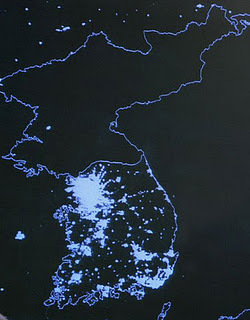 Where are lights in North Korea? Only one? Yes, because wealth comes from commerce. No commerce, no wealth, no lights. Can you imagine a better illustration of the triumph of commerce? North and South Korea were not always so different. After World War II Korea was split into two separate countries, with South Korea ruled by the U.S. and given the opportunity to develop commerce and democracy. North Korea was pulled into communism, where those who participate in profit-making are deemed criminals. Observe in the graph below how South Korea pulled away from its northern brother. Commerce is a blessing, and North Korea was not blessed. This is our world, our beautiful, prosperous world. We must understand it to preserve it. What is this world, exactly? Roughly, it is one-third government and two-thirds commerce. Consequently, that is the composition of this course: two-thirds about the world of commerce, and one-third how government policy interacts with commerce, and the consequence of all of this on our lives and the lives. Finally, we must understand economics because other people understand it, and we must not only communicate with them but earn their respect by our knowledge. Below are two videos showing how an economics degree can be valuable: to exert authority over others in debate, and to get jokes said on TV.